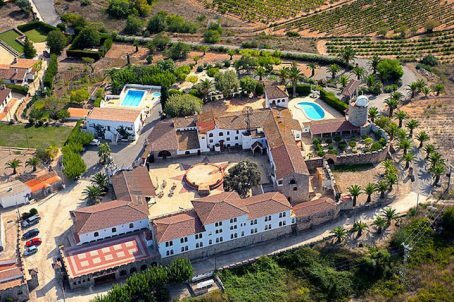 · The estate consists of 300 hectares of woodlands, vineyards, olive groves, and residential plots and a running small hotel/events business. It’s located only minutes from the beaches of the Mediterranean Sea, and less than an hour from Barcelona and 30 minutes from Tarragona, Port Aventura and the future business and leisure city of BCN World (www.bcnworld.com). · The estate is sold with a license to sell 20 residential plots, and the possibility to sell off a further 30 plots when the first 20 have been developed. This allows for a unique opportunity to create an exclusive residential community in the midst of unspoilt nature and with panoramic views. · The hospitality business comprises of 24 guest rooms and apartments in a historical mansion, a fully equipped and licensed restaurant, event rooms, pools, gardens, and 16 tourist apartments on the grounds. Contracts with international travel agents, local wedding coordinators, and catering companies are in place. · The historical mansion is the perfect setting for an exclusive boutique style hotel with high, personalized service, and a gourmet restaurant. The vineyards, and the opportunity to set up an artisan vinery for estate wines, add the potential to turn the mansion and tourist apartments into a wine resort and spa. The old wine cellar of the mansion is preserved as a museum of wine, offering an additional attraction for wine tourist visiting the area and the neighbouring Penedès, Priorat and Terra Alta. · The woodlands offer potential for rural tourism, including equestrian, and hunting. Log cabins could be set up in the woodlands, and sold on a time-share basis. Six major golf courses in the area, and the prospect to construct a Pitch&Putt course at the estate, provide a great attraction for golf tourism. The proximity to Port Aventura, today attracting 4 million visitors annually, and the project of BCN World with theme parks, shopping centres, and luxury casinos ensures a growing amount of tourism in the area. · The projected BCN World is predicted to bring 17,000 new jobs to the area, and will greatly multiply both tourism and business travel. The international airport in Reus (Barcelona South) is expected to expand their flight network to meet the increased demand. This forecast a substantial rise in property prices in the area. ** FULL DETAILS ON REQUEST.